It’s time for another Community Checkpoint. This week we get to meet the gaming community named The Art of Warfare or TAW. This particular gaming community has a very large player base in various genres of games. They have multiple guilds on two different servers. Now, while they sound like a huge guild, they are very focused on a welcoming environment and promote many different ways to enjoy SWTOR. From various guild events, PVE and PVP in SWTOR, TAW has something for just about anyone’s playstyle. We will see what kind of rank system and chain of command they utilize and also how they also contribute to charities. Can you tell us a little about yourselves and how you got into gaming, SWTOR and how you got involved with the TAW gaming community? Well, as a diverse family of gamers we come from many backgrounds in gaming. We’ve got members and officers that have been playing MMO games since Ultima Online, and people who came from some First Person Shooters, too. Most of the people in our Star Wars family were recruited through in-game methods, like recruitment advertisements, or requested an invite after having played with some TAW members. How did TAW gaming community get started? How many members does the community consist of and are there other games the guild/community plays consistently? 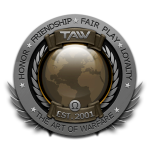 TAW has a long and storied history starting in the early months of 2001 and was started by people who played Delta Force together. By March of 2001, the website www.taw.net was getting put together, and members were being screened for the Delta Force team. 2001 was a busy year, seeing the launch of taw.net in mid-March, a new game was added: Ghost Recon, Task Force Operations was founded as a board to oversee TAW business and finally 2001 culminated with recruitment being opened into the European region leading to a January 2002 competition between the NA and EU Delta Force teams. From there TAW expands rapidly. By 2010 TAW was playing 12 games and had established a military-like structure consisting of Divisions (the game level) and Corps (multiple games) with guild positions available from member to Commander in Chief (an elected position). As of today TAW plays 33 games with 3 more on the horizon. Our membership totals 2,498 and still growing. Our Star Wars community consists of 221 members. What led to the guild getting involved with SWTOR? What faction and server are associated with TAW? As with every game, TAW plays, the members led to our involvement in SWTOR. When a member or group of members wants to see a game added to the TAW army, they send it up to the Vanguard team, propose the game, discus how it will work, and why it would be good for TAW. Once the game is approved by Vanguard, members are assigned to leadership roles to help the new guild get on its feet, and recruitment starts as soon as the game is live, or the guild is founded. Currently TAW has 4 main guilds in SWTOR; 2 Empire and 2 Republic, our North American server “The Prophesy of the Five” has both and Empire of TAW and Republic of TAW guild, as does our new and growing European server: “The Tomb of Freedon Nadd”. TAW focuses on core values; can you tell us those values and what they mean to the guild? How does the guild apply these core values in gameplay? The Art of Warfare (TAW) focuses all of our efforts into maintaining our core values. They are Honor, Integrity, Fair Play and Loyalty. It defines how we treat others, both in the guild and out of the guild. We strive to have an open, safe, welcoming environment for everyone to come into. As a guild we do not allow cheating of any sort or for any reason. No hacks, no exploits, no scripting. We foster a sense of family with each other, and are there to help in any way we can. For us, we are a family-friendly environment that seeks to excel at gameplay through skill and practice. In-game, this means that we dedicate our time to developing strong players while maintaining many casual teams for players that don’t want to focus on the most advanced content. Does TAW have a ranking system or chain of command? How did you come up with this system and are there any real life experiences that helped setup this chain of command? The TAW ranking system is setup in a fashion that resembles a military chain of command. Our introduction to the guild is called a “boot camp”, led by a “Drill Instructor”. Once we get you introduced to the guild, you become a recruit, from there you move up a standard ranking system based on merit and time in guild from Private First Class to Lance Corporal and all the way up to Sergeant for regular members. We have a lot of officer positions, too from our introductory Drill Instructors and Fire Team Leaders (they run groups for operations or PvP) to Squad Leaders, Platoon Leaders, Staff Officers, Executive Officers and Commanding Officers for both Empire and Republic factions. This chain of command allows everyone to participate at their level of comfort, and provides solid support for anyone involved. Since you are a larger guild in SWTOR, does it help to focus on multiple gameplay areas? What areas in SWTOR does TAW primarily focus on? As a guild with more than 200 members, we have a lot of people with a lot of different things that they want to do in-game. Rather than focus the guild as a whole, we allow our members and officers to set up teams. We have teams for PvP and PvE alike, doing everything from Story Mode operations to help get new players gear and experience to our 10/10 Hard Mode Dread Fortress and Dread Palace progression teams for each faction. On the PVP side, there are teams for the commendation grind for gear, and teams that do group ranked arenas. We have several teams that do special things, too. Right now, there is a group looking to complete the Terror From Beyond and Scum and Villainy bonus bosses: The Dreadful Entity and The Hateful Entity for the title “Dread Slayer” and Eternal Warrior” as well as the Dred Masters Crown legendary head piece. Progression is one of the areas the guild focuses on, how has the guild fared? What has been the guild’s greatest achievement in Ops and what has been the biggest challenge thus far? Well, as mentioned above we have 2 progression teams: “Emperor’s Hand” for the Empire and “Wookie Time” for the Republic, they are currently 10/10 HM DF/DP. It hasn’t always been a smooth ride, though, and challenges have arisen on both teams to establish our expectations and standards, as well as get a core group of people to coalesce into a team. Wookie Time’s greatest source of pride was the Dread Guard fight from Terror From Beyond in Nightmare Mode. They completed this, just days before Oricon and the new operations (and gear) were released. It was a hard fight, but the teamwork and coordination required to get it done made it very satisfying for that team. The Emperor’s Hand team was excited to power through Dread Palace Hard Mode on a one-shot, particularly satisfying was downing Raptus HM 7-man when one of the tanks was disconnected during the fight. From some of the material I read about your guild community, you host several various types of guild events, correct? What are some of these events? Is there a committee in the guild to organize these events? Are there any events the guild is working on for the near future? Does TAW ever allow other guilds or players not associate with your guild to participate? We are super excited about our upcoming event: The TAW Olympics! Opening ceremonies are slated for March 23rd and the Olympics will go for 3 months with a huge grand prize at the end, and prizes for medals to be handed out each week at the event. We have a team of Field Specialists who plan, prepare for and lead events, and the TAW Olympics are the culmination of several months’ work on their part. We will be hosting speeder races, 1v1 and small group PvP tournaments, Operations challenges, scavenger hunts, races to level 10, World Boss challenges and more! Recently, on Tatooine, the Republic and Empire of TAW started a massive World PvP war that spanned outposts Thorazan and Zaroshe! Dozens of players came in to help take over, and take back the bases, and it spilled over into the lawless sands. Several guilds, and even unguilded players joined us in our friendly slaughter! The rewards for Ranked PVP have been announced, what does the guild think of the rewards? Does TAW have a presence in the Ranked PVP side of SWTOR? Many of us in TAW are very excited to get our rewards for season 1! The Rancor mount is on everyone’s mind, and we’re all eager to see the titles bobbing around over our heads, too! Empire of TAW has 2 Ranked PvP teams and they’re both doing very well sitting on Team Ratings over 2000! The Republic of TAW has just established some new PvP leadership, and their ranked team is up-and-coming generating some very challenging fights for our Empire teams! Aside from events to nurture guild growth and build a sense of family, are there other things the guild is planning to help others by way of a charity? We are super-excited to get together and do what we love to help children get the medical attention they need! 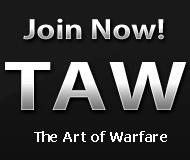 Is the TAW gaming community currently looking to recruit new guild members? If so how is the best way for potential new recruits to contact guild leaders or find out more information about the community? What areas of SWTOR does the guild want to see BioWare improve? If the guild could request one thing, to be added to SWTOR, what would it be and why? Taw would love to see some guild-based Quality of Life improvements. Guild Capital Ships would be our one major request, complete with GTN, mail boxes, cargo hold and guild bank terminals, training dummies and dueling zones. I would love to see crew quarters there as well, allowing for some housing options and a ship hangar where we can see our class ship, as well as our GSF ships. We wouldn’t argue with some new PvP maps and new Ops, and are excited to see what Bio Ware has for us this year! I want to thank Absalom for all his time and help with this week’s article. Special thanks also to all the members in The Art of Warfare gaming community for letting us get to know more about their guild. If you are on the Prophecy of the Five or The Tomb of Freedon Nadd servers and looking for a guild, why not give The Art of Warfare guild a try. That’s it for this week’s Community Checkpoint. Would you like to have your guild, event or server group highlighted on Corellian Run Radio? All you need to do is submit your guild’s website and some basic information in an email to me at, jason@corellianrun.com or corellianrun@gmail.com. Your guild could be who we highlight next here at Corellian Run Radio. Thanks and see you next week!